Hello everyone: Finally!!! Spring is Here!! (Hopefully to stay) and since after the April Showers come May Flowers here's the theme and inspiration photo over at RETRO RUBBER for you to play with this time. 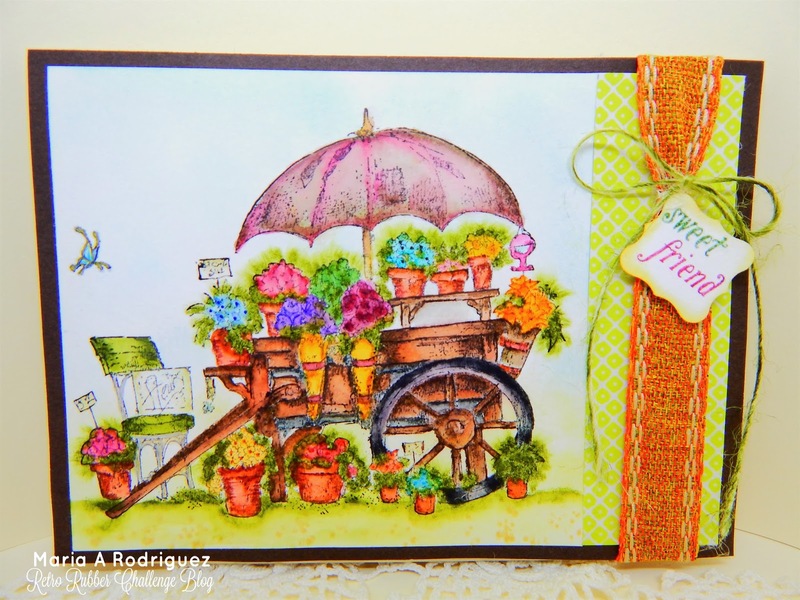 My card is from "I Brake for Stamps" and it's called French Flower Cart, I love the beautiful flower pots and the fresh flowers in them. The cart with its umbrella is just so sweet. This stamp dates back to 2015, I'm so happy I wrote the year when I bought it in the back of the plain rubber stamp. I stamped this image on some watercolor paper with Stazon black ink and colored it with SU markers and Sakura Koy watercolors. The ribbon and twine are from my stash. 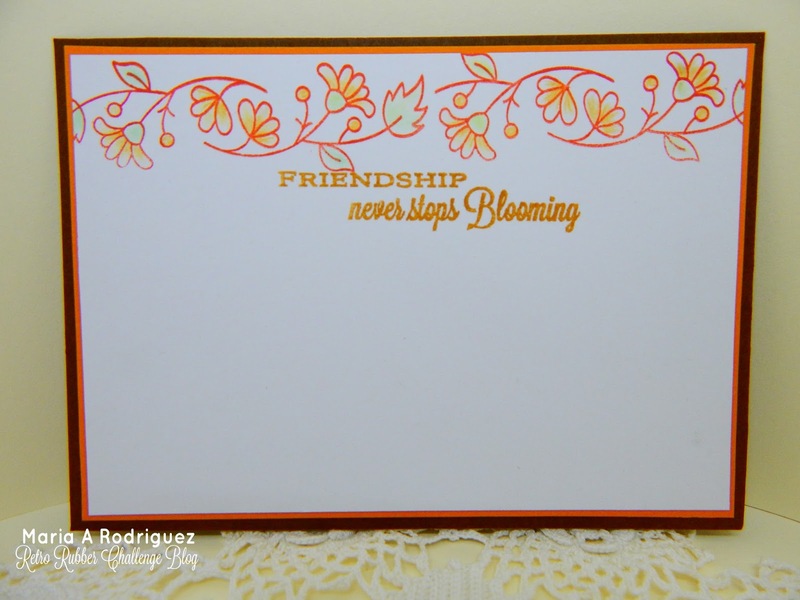 The sentiment is from an old Flourishes set called "Tulips for Friends"(bought it when it came out in 2013, discontinued) and the border on the top is from a retired SU set called "Bordering Blooms" from the 2014-2015 SU annual catalog. I hope you get inspired to come and play with us at RETRO RUBBER, please don't forget to use at least ONE STAMP THAT IS OLDER THAN ONE YEAR and let us know how old is it, ok? Also, visit my teammates' blogs for more awesome inspiration. CCC Digi Creations Challenge #92 "Flower Power"
Craft-Dee BowZ Anything goes, include a handmade bow. 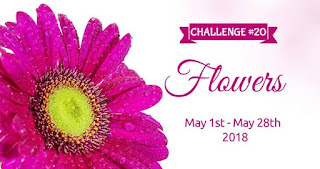 Let's Craft and Create Challenge #137 "Anything Goes option Lace, Ribbon or Twine"
Hello everyone: It's time for another SHOPPING OUR STASH challenge so, for the next week our theme is BUTTERFLIES. Here is my card that hope will inspire you to play along. This butterflies were stamped with the retired Stampin' Up! set called "Papillon Potpourri", love it fro the beautiful images but also, because it has the coordinating punch for both sizes of butterflies. I stamped the images on white card stock and sponged each one with a different color of distress inks then, I used Prismacolor pencils for the shading. I punched them out and adhered them with glue dots to the card, the pattern paper is from a discontinued line from Lili of the Valley. The sentiment is from my stash where I put them when I change my mind, they are very handy to have around, I sponged the oval with the same inks as my butterflies. 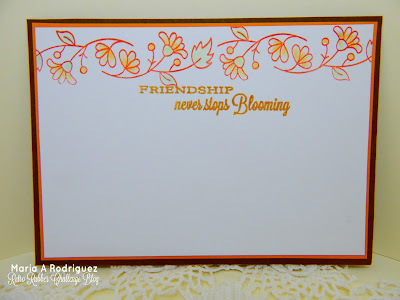 The sentiment is from an old Flourishes set called Gerbera Daisies. 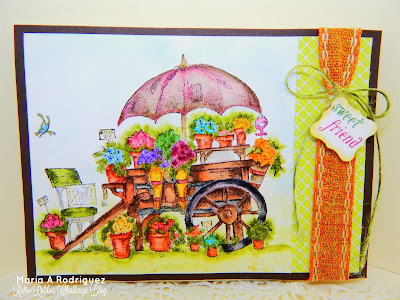 I hope you play along with us over at the SHOPPING OUR STASH challenge, for more inspiration, visit the blogs of my teammates to check out their beautiful creations. Daisy Chain Challenges #19 "Animals"
Pearly Sparkles Challenge "Things with Wings"